The Philippine Stagers Foundation (PSF) stages their newest musical play, Cory ng EDSA: A Filipino Musical, that premiered on July 16, 2011 at St. Cecilia’s Hall, St. Scholastica’s College, Manila. 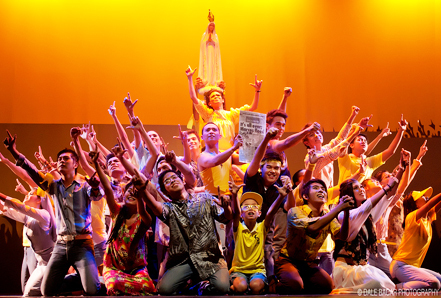 The musical runs until October 16, 2011. Cory ng Edsa tells the story of Corazon C. Aquino through the eyes of Peter, a reporter who followed her life amidst all the struggles her family and our country was going through. Anyone who has lived in the 1980’s and who has witnessed the EDSA Uprising in 1986 can definitely connect to the story of Cory and how she fought for our freedom and became our country’s president. Cindy Liper perhaps is the youngest actor who played the role of Cory. She admits that one thing she has difficulty with is identifying to Cory’s role as a mother. But I can say that Liper shows promise in portraying the character of Cory. What is also interesting about this play is that playwright & director Vincent Tañada has included characters that are not familiar to the common public. These characters have played a vital role in Cory’s life and how she exuded goodness to help others and think of their welfare. The play is quite long because there are so many things happening in the fast-paced play, showing the viewers different scenes from the past and the present. Play and Direction by Vincent Tañada. July 31, August 6-7, 13-14, 18, 20-21 and 28; September 4, 10-11, 17-18, 24-25; October 2, and 15-16. For more information, you may contact the Philippine Stagers Foundation office at (632) 781.6727 or +63.923.2680527.